I often try to keep my personal voice off this blog to keep an air of objectivity when covering elements of Saturday mornings that I may not exactly be a fan of, but acknowledge that others are. 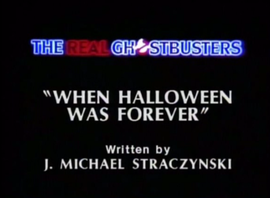 But, for this, the final part of our Real Ghostbusters 30th anniversary celebration on the weekend before Halloween, I’ve decided to share my picks as the best episodes of the animated series. Now, these may not be THE greatest in any critical terms, but they are the ones that I extremely liked or proved memorable for one reason or another. 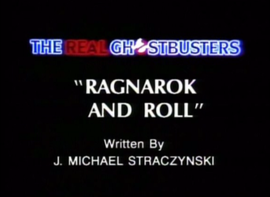 So, I give to you: MY TOP 10 (or so) REAL GHOSTBUSTERS EPISODES! Do you like them as well? Do you have different favorites? Let us know in the comments or on our Facebook pages. 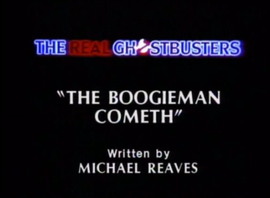 Meghan and Kenny Carter come to the guys to get the Boogieman out of their closet, leading to the revelation that Egon has encountered him before. For that much closet space, I bet those people could learn to live with a ghost. Who hasn’t been scared of something in their closet when they were younger? 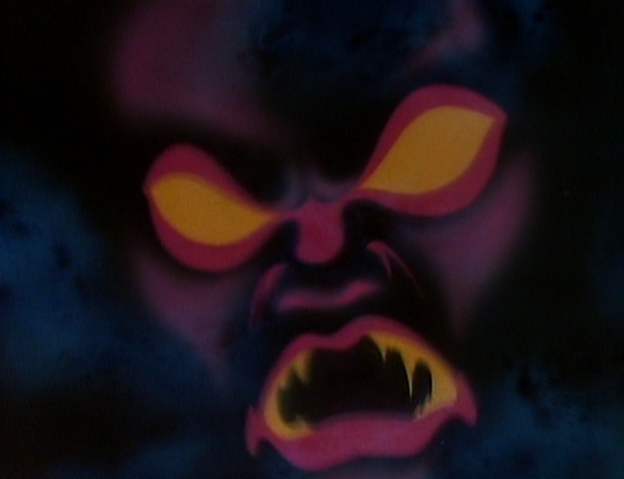 This episode takes all those fears and wraps them up into the fearsome guise of the Boogieman. His design, and the design of the world he lived in, were phenomenal and the story certainly pushed the scare factor as far as it could go. 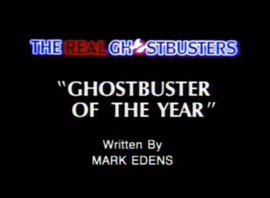 It also gave us a little insight into Egon’s motivations and what drove him to become the scientist we all know. Samhain, the spirit of Halloween, is freed in New York and seeks to make Halloween eternal. Revenge! Revenge for all the pumpkins you have slain! 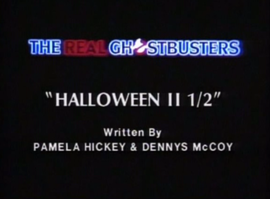 I can sum up why this episode rocks in one word: Samhain. 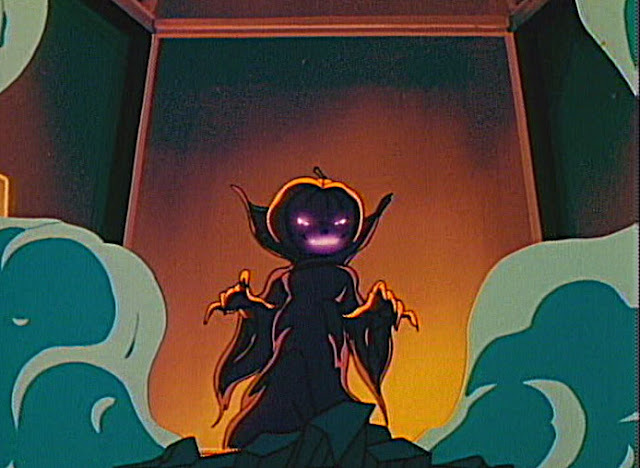 You have a super creepy dude with a pumpkin head who wants to make Halloween last forever? What kid WOULDN’T love that? Because of the nature of the show, there are very few recurring foes. The Boogieman and Samhain were two of them, which speaks as much to their appeal as their story potential. 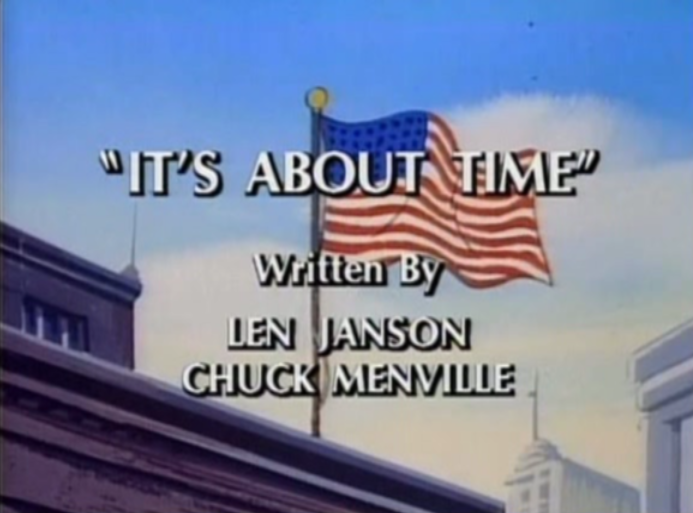 This is also the first of several episodes by J. Michael Straczynski you’ll see on this list. 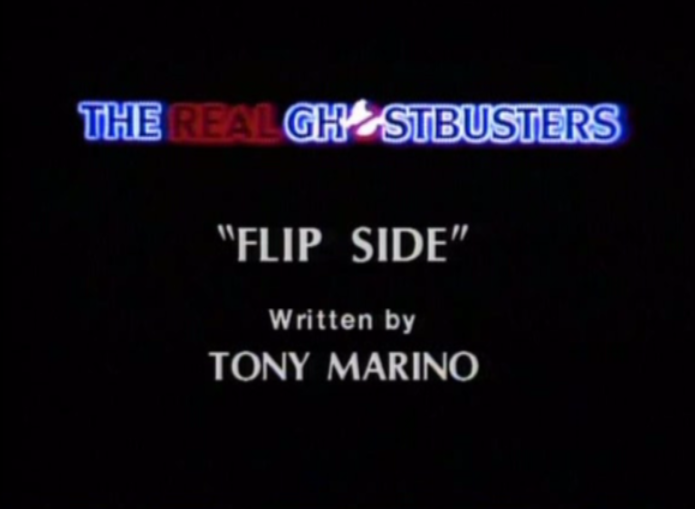 While it takes a team to make a show, he was largely responsible for the tone of the earliest episodes and what endeared viewers to turn in every week and make it the success it was. 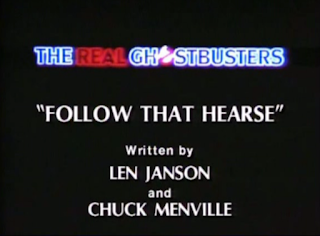 While overseeing the production of their movie, the guys have to face a ghost terrorizing the studio demanding absolute quiet. It's a cartoon based on a movie who made the movie in the world of the cartoon. Woah. Meta. 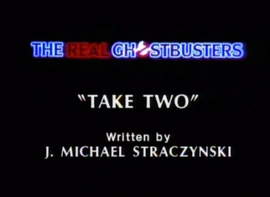 Aside from tying into the movie (along with a brief clip and Bill Murray’s re-dubbed dialogue at the end), the episode is fun because it shows the Ghostbusters’ ingenuity in dealing with problems without the aid of their equipment. It also shows a bit of a simplified take on the movie-making process; so aspiring filmmakers, don’t think it’s easy as all that. 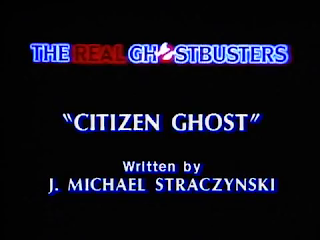 Reporter Cynthia Crawford gets the story of what happened following the Gozer battle and how Slimer came to live with them. 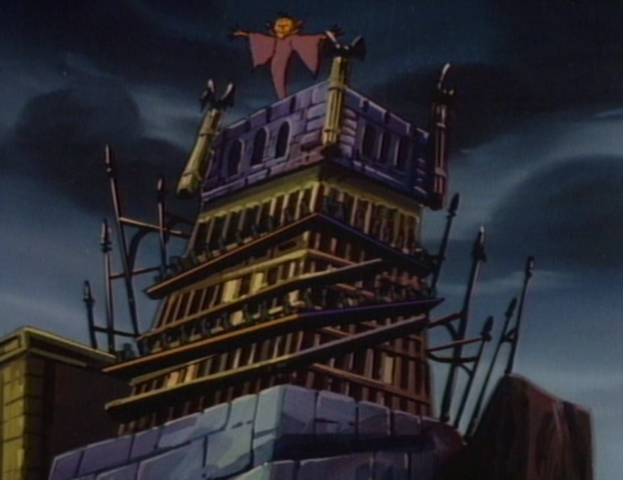 The second movie-based episode, showing the aftermath from the first movie. It did something few tie-in programs ever or would ever do: explain the differences between it and the source material. Why did the Ghostbusters get colored uniforms? Real world answer: In order to better differentiate the characters in far group shots and make toys more appealing for purchase by parents. Cartoon answer: Because the tan suits absorbed so much spectral energy and had to be destroyed. Why is Slimer living with the Ghostbusters? Real world answer: To give the team a cute mascot to appeal to kids. Cartoon answer: So Egon could study a ghost in a controlled environment. The lesson: never skip laundry day. 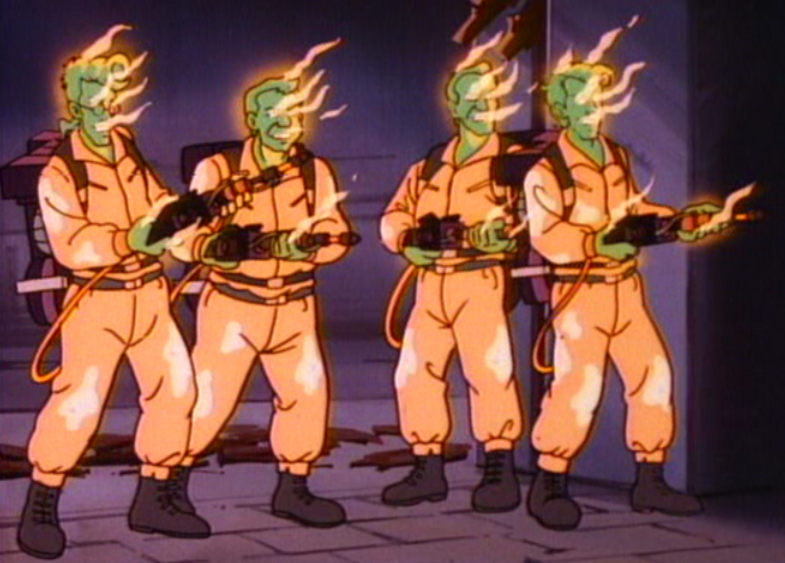 Also, the Spectral Ghostbusters? Killer design. Heartbroken Jeremy uses a magic flute to bring about the end of the world. Ominous face in the clouds? Check. One of the few character-driven episodes, the thing that makes it memorable are the visuals. 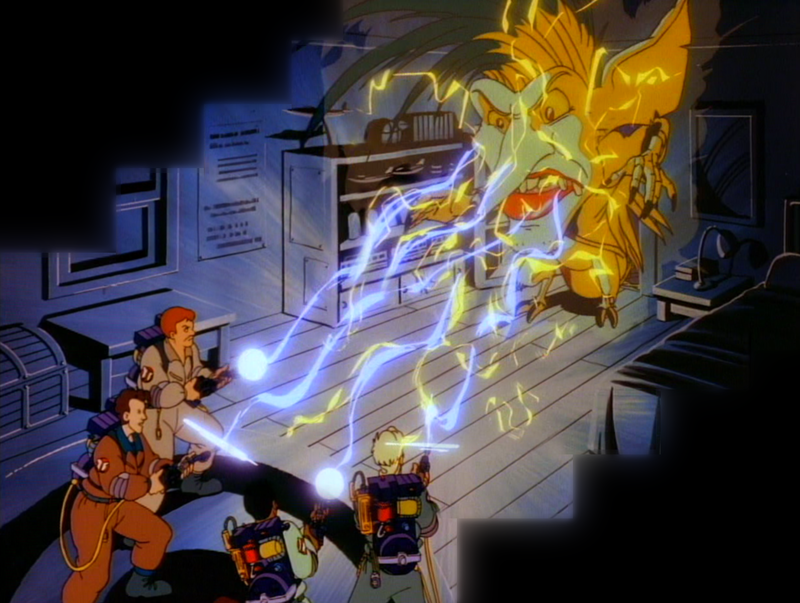 The final act had incredible designs and effects. The story itself was touching and showed that not everyone deals with heartbreak well. You can’t have a show about ghosts without a haunted house episode. But, how about a haunted CASTLE? Besides some funny sight gags and Citizen Kane overtones, the most memorable thing about this episode is when objects in the house would come to life and attack the guys. Specifically, one instance that always stuck with me was when the pool balls and cues came together to form a “man” and chased them through the halls. Cool and creepy at the same time. Samhain is freed from the containment unit and turns the firehouse into his own personal fortress. This is one of the dreaded later episodes that featured the maligned Junior Ghostbusters, but it also featured the return of Samhain. While this episode didn’t get a chance to push the envelope as much as some of the earlier ones, one thing I thought was cool about it was how Samhain altered the firehouse into his fortress. 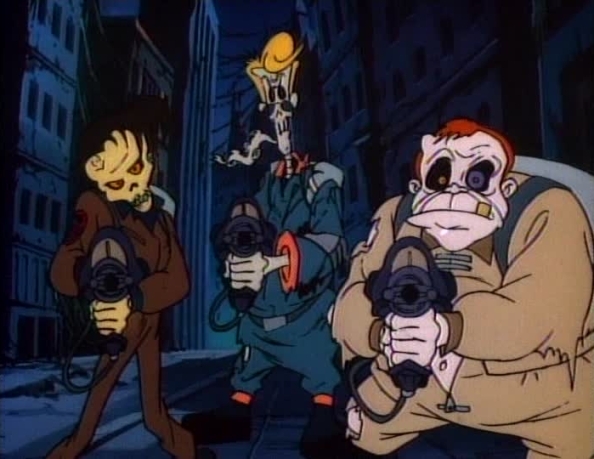 The design looked like something out a Tim Burton movie, and it always made me wonder what a Burton-fueled Ghostbusters movie could look like. There have been inspired designs in the franchise in the past, but Burton has that extra creepy touch. 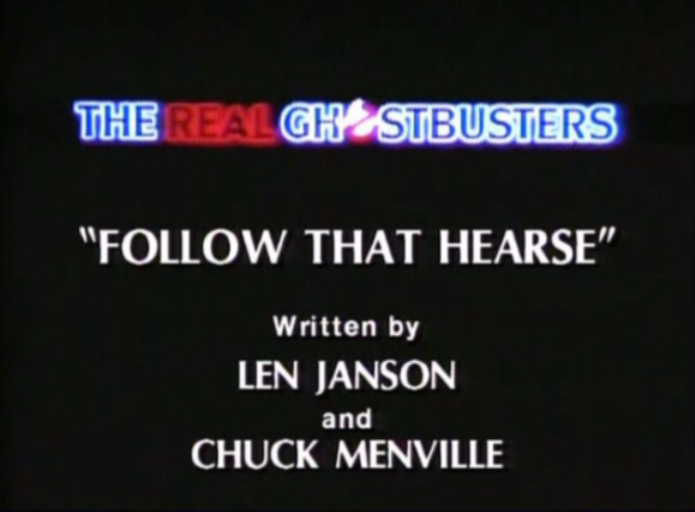 Peter, Egon and Ray are transported to another dimension where ghosts live in the city and mortals are dealt with by the Peoplebusters. Don't get on their bad side...whichever side that is. The first episode to feature Buster Jones as Winston is also one that features him the least. Alternate universe stories is another common science fiction trope, but again extreme credit goes to the stellar animation staff The Real Ghostbusters employed. 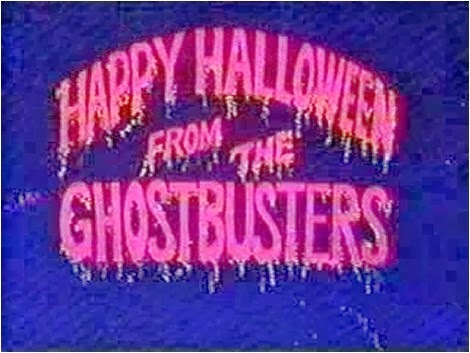 The design of Boo York and the Peoplebusters make this episode memorable. Unfortunately, Winston was denied his alternate version and would be for two decades until Cryptozoic’s Ghostbusters: The Board Game II decided to include them (and Winston) as alternate playable character pieces. 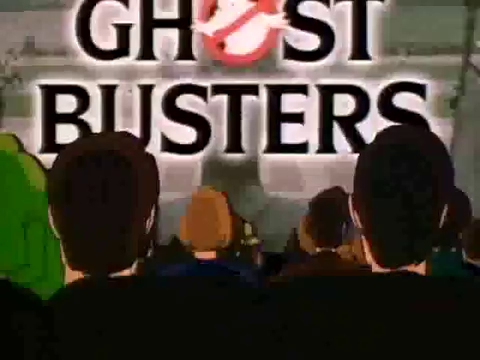 A ghost escapes the guys and possesses Ecto-1. If this episode had come earlier in the series, I’ve no doubt the metamorphosis Ecto-1 underwent would have been a lot more sinister, maybe even approaching the lines of Christine. 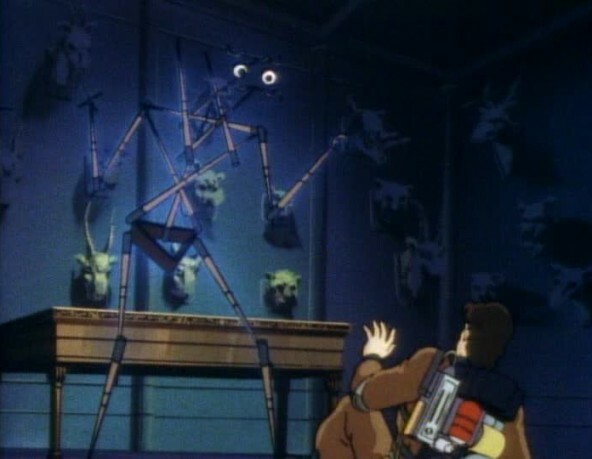 But, we get a good glimpse of what might have been in the somewhat cartoony interpretation featured in this episode. The guys realize Janine has gone through many unexplained changes over the years, learning there’s a supernatural reason behind it. Whenever your loved ones undergo a radical change, check for evil genies first. When all the network-mandated changes to the show yielded a ratings decline, ABC offered J. Michael Straczynski his position back in an attempt to repair the damage. Straczynski declined due to other commitments, but offered to write a few episodes under the provision that they’d be done exactly how they used to be. 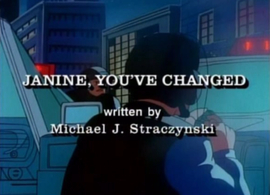 This was one of those episodes, which sought yet another in-universe explanation to all the changes made to Janine’s character model over the years. 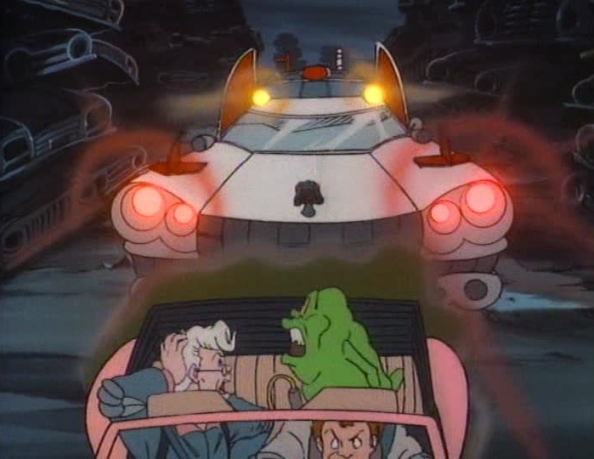 An accident with a trap sends the guys and Slimer back to 1959. Black and white TV wasn't the best time travel indicator: some of us still had them in the '80s. Ah, time travel. A common trope in science fiction, and not always done right (especially if your name isn’t Marty McFly). This short episode always held a special place for me. It wasn’t thought-provoking or one of the greatest, but I do enjoy a good romp through history and understand waxing nostalgic about a previous age (why the hell else would I run this site?). It was also ended up being an oddly prophetic episode as the plot device of the city confiscating the firehouse land for an urban renewal project is a common event in and around 21st century New York City. Many buildings as old as the firehouse lain to rubble and serving as the foundations for monumental glass monstrosities.